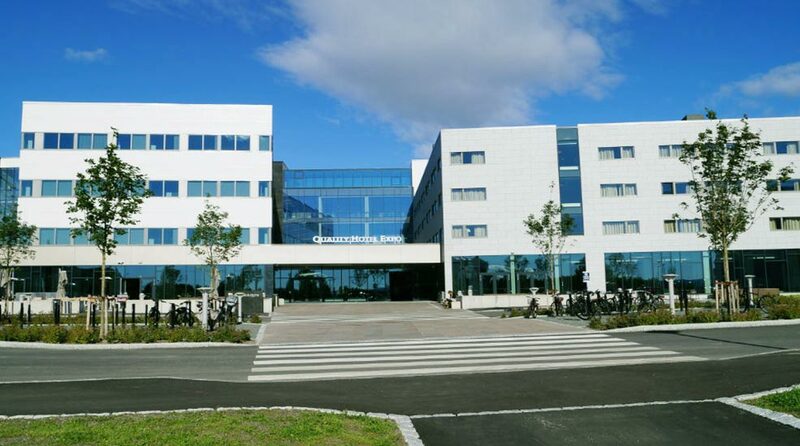 The Quality Hotel Expo is a conference hotel in Fornebu on the outskirts of Oslo. We want to create an environment that's perfect for innovation and inspiration. We call this a factory of ideas. The Quality Hotel Expo is the most unique and flexible conference hotel in Oslo. With a great location in Fornebu, guests can enjoy beautiful surroundings right next to the fjord. The hotel features fabulous Scandinavian design, green spaces, great lighting and high-effect ventilation can creates a special kind of harmony between nature and technology, and knowledge and creativity. Our facilities are equipped with the very best technology to ensure that you can focus on getting the most out of your meetings. Our staff and partners will help you to customise your event to suit your needs. Let us help you to make this your best event yet! Quality Hotel Expo is cash-free, which ensures added security for our guests and visitors. More information about this can be found under FAQs. The Quality Hotel Expo isn't just a conference hotel. As the only beach hotel in Oslo, we are as suitable for meetings and conferences as we are for holidays – for adults and children alike. And with our unique location directly next to the Telenor Arena, it's easy to combine a cultural experience with an overnight stay at our hotel. Read more about Oslo here. Our restaurant concept Brasserie X combines French brasserie traditions with high-quality Nordic cuisine, and its food philosophy is based on delicious, simple dishes prepared from scratch. Our seasonal menu guarantees you a culinary experience that is not only delicious, but also the origin of energy, courage and enthusiasm. For great cocktails and a wide selection of beers and wines, we recommend a visit to Bar X. Let's work together to help children at risk of human trafficking get a good night's sleep. When you stay at the hotel for more than two consecutive nights, you can choose to be part of our Sweet Dreams Stay campaign by foregoing room cleaning. We will donate a sum of money to UNICEF to help their efforts in combating human trafficking every time guests choose not to have their rooms cleaned. Many thanks for your cooperation! Take the airport train to Lysaker, then change to bus 24, 28, 31, 31E or 36E to Fornebuparken. Space for stalls for a trade fair. The journey to Oslo S takes about 30 minutes.